Hockenheim, 12.11.2018 – The sustainability and recyclability of their solutions is a key issue for the packaging experts at Sonoco Consumer Products Europe. Advanced In-Mould-Labelling (IML) technology and a focus on mono-material enable them to produce plastic packaging solutions that are almost completely recyclable. The cyclos-HTP institute for recycling and product responsibility recently tested Sonoco’s polypropylene (PP) packagings that are currently being used on the market by several clients. What it found: the Sonoco packaging solutions offer an extraordinarily high recyclability of close to 100 percent. Sonoco’s IML containers are used for a wide variety of food – from snacks like precooked sausages to fresh dairy products such as yoghurt. 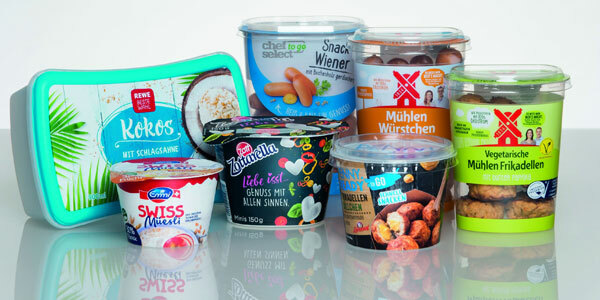 In the dairy segment, the mono-material packaging outdoes other common solutions such as plastic containers wrapped in cardboard for a more naturalistic look. Made from two entirely different material groups, the cardboard wrap-around and the container need to be separated completely to be recycled. Many of these packagings, however, end up in the recycling systems unseparated, which is why they are attributed recycling rates of under 50 percent. At roughly 70 operations across Europe, Sonoco provides customers with a wide range of consumer and industrial packaging solutions. Consumer goods packaging solutions include composite cans, drums, and luxury tubes (also called rigid paper containers) with a variety of closures; plastic packaging; packaging services; and graphics management. Sonoco’s industrial division produces a portfolio of cores, tubes, and spools made from highly engineered paperboard or plastic for use with paper, textiles and specialty films. The Sonoco Thermosafe unit offers customers temperature assurance packaging solutions for the transport of temperature-sensitive products such as pharmaceuticals and other biologics. Utilizing a range of packaging materials, technical disciplines, material science and manufacturing capabilities, Sonoco takes a holistic approach to providing customized solutions that meet customers’ unique needs. To learn more, visit www.sonocoeurope.com or www.linkedin.com/company/sonoco-consumer-products-europe/. Founded in 1899, Hartsville, South Carolina-based Sonoco is a global provider of a variety of consumer packaging, industrial products, protective packaging, and displays and packaging supply chain services. With annualized net sales of $4.8 billion, the Company has 20,000 employees working in more than 300 operations in 33 countries, serving some of the world’s best known brands in some 85 nations. For more information on the Company, visit www.sonoco.com.